I remember reading a chick-lit book in which the author gently mocked the protagonist’s tendency to carry everything but the kitchen sink in her handbag, out of fear of being unprepared. This tick, which was of course neatly resolved at the end of the novel by the heroine’s One True Love, never seemed so horrible to me. After all, I have children, and if children are going to do one thing to you, it will be to leak bodily fluids all over your pants’ leg. You can buy prepackaged emergency kits in a drugstore, and I do admire their neat packaging and coverage of every potential emergency. But do you really need to carry a roll of gauze in your purse ‘just in case’? My theory is that your purse (or briefcase or diaper bag or messenger bag or whatever it is that you use to carry your most necessary possessions) needs to have just enough first supply aids in it to get you back to the car or to the nearest hospital or allow you to keep on talking and your kids to keep on playing. Most of the time you are not likely to be hiking in the woods, or on a desolate highway in the middle of the night. You’re much more likely to be on a playground or in a bookstore and you just need to be able to stop the bleeding enough to be able to get on with what you were doing. So, I now make my own emergency kits. I have several stashed away in various opportune places: purses, pockets, glove boxes. I start with a pretty, small box. Celestial Seasons tea used to give away tins with their teas, those are good. Or an Altoids container (well washed) would work. You could even buy one, but that defeats the whole purpose of making your own, doesn’t it? The one I’m carrying currently was a freebie with some breakfast bars, designed to be able to carry the bars in your bag without reducing them to crumbs. Then, assemble what you need to treat whatever emergencies you might come across. Band aids of varying sizes and superheros, of course, and maybe some antiseptic wipes. Perhaps a tube of antiseptic ointment. A small vial of super strength ibuprofen. I tucked a tube of saline solution (meant to wash irritations out of eyes, but which could also serve to clean a scrape) and some chapstick into my emergency kit, along with a pair of tweezers. The point is that you decide what you really need to include to treat an emergency. Remember, however, it only needs to be just enough to allow you to finish the park date in peace. 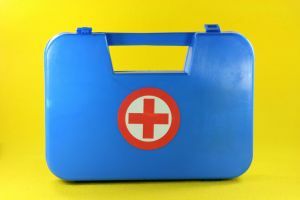 Do you carry an emergency kit on your person? In your diaper bag? In the trunk of your car? (What’s an emergency kit?) What do you keep in it? Have you had to use it lately? You know… I need to put one of these together.. and carry some bandages in my wallet – they won’t take up much space. Thanks for the tip! i rarely carry anything but the keys to my home and office 🙂 but this is a great idea i will file away for when there are little ones! I carry a full on First Aid kit (pre-packaged drugstore suitcase type) in the trunk of my car, but have yet to pack a mini-kit. I need to do this! I’m putting together a diaper bag right now, so I will definitely include a kit in there. I’m thinking that a diaper bag sized wipes container would be a good size (very flat, but still holds quite a bit). Thanks for the suggestion! Penguin Lady, that is TOO funny! I’m with Holly, I have a suitcaser (prepacked with additions) in my car and by my front door but no on the go bag. I do carry bandaids in my mini diaper pod. But what I want to tell you is my favorite first aid kit tip ever! Somewhere I read you should keep a dark colored rag in there cause what freaks many kids out is seeing their own blood. White cloth, bright red blood, freakage. Love that idea but have yet to actually find and carry the navy rag. I have a full sized emergency kit in each car, and when we go hiking or for a picnic in the woods I carry supplies that are adapted to the situation. I learned that lesson after my husband was bitten by a horse- very scary! Mama Bird, I like your suggestion. Maybe you could just toss some old washcloths in the load if you ever dye something. I have a home-made kit for emergencies and other situations in my car. I use a small tool box. I have the normal band-aids, ointment, hand sanitizer, and such in it. I also keep benadryl on hand for any weird stings. We live in a fairly buggy area, so I also keep bug repellant wipes on hand. I also keep a couple of those solid sticks of sunscreen which are always much needed where we live. Also, I keep nail trimmers, emory boards, tweezers and small scissors in my tool box. One of my kids has a tendency to pick at his nails if he has a rough spot and I’m trying to nip that in the bud by being prepared to deal with hangnails and such while on the go. Two items that are not necessary, but nice to have that I keep in there are dental floss and a small tube of hand lotion. It seems like a lot, but we are on the go a lot and we spend a lot of time outdoors. This little kit just keeps us comfortable in most situations. The other thing I keep in my car is a snack basket with granola bars, small packs of nuts, juice boxes, and crackers. This keeps us from making unnecessary food stops and allows for impromptu stops at the park. That’s a lot of stuff! But I can see how it’s a necessity for you. I always have a bunch of snacks in the car like you do, for after school or days when I’m too rushed for breakfast. I keep bandaides, a couple of sanitizer wipes and hand lotion in my purse (also a travel toothbrush, sample sized toothpaste and floss!). The car has one of the prepackaged kits. I also keep a tiny sewing kit in my purse – it’s packaged in a little slide apart box about the size of two credit cards stacked together – VERY useful. There was an article many years ago in Mother Earth News with instructions on making pocket e kits for hiking, etc. The thought was to have something so small, light and inexpensive that you could slip one into the lining of every jacket that you own and thus never be without one. That’s not a bad philosophy. I keep maxi pads and a bottle of sterile saline in the glove compartment to deal temporarily with any bleeding injury that might need more than a bandaid.